After a long time without doing any modding (except repairing my grandson's guitar), I have decide to get the tools back out for a couple of upcoming jobs. The first is to my Aria TA-50. I stuck a set of D'Addario ECG23 XL Chromes Extra Light (.010-.048) strings on, a while back, and though I like them they are a little heavy for the nut slots and tend to stick on tuning. Add to that the fact I had moved the first string in, a bit, from the edge of the fretboard, and the fact that the white nut was too bright now that the binding is starting to mellow, I decided to fit a new Ivory coloured nut. So that is job number one. I am also passing on my "Stratru-caster"
which was built using donated parts and as a result only has Squier electrics currently fitted. As this is a special gift I am fitting a set of IronGear Pig Iron, overwound, pickups and new electrics, before we part company. I have the new electrics (pickups ordered), so I am going to do a rebuild. I have a spare Strat pick guard, so I will build on that, then when complete and tested, I will transfer everything over to the custom pick guard. It will be nice to do some wiring again. Just a standard Strat set up (other than the overwound pups), but it should be better than the Squier stuff! 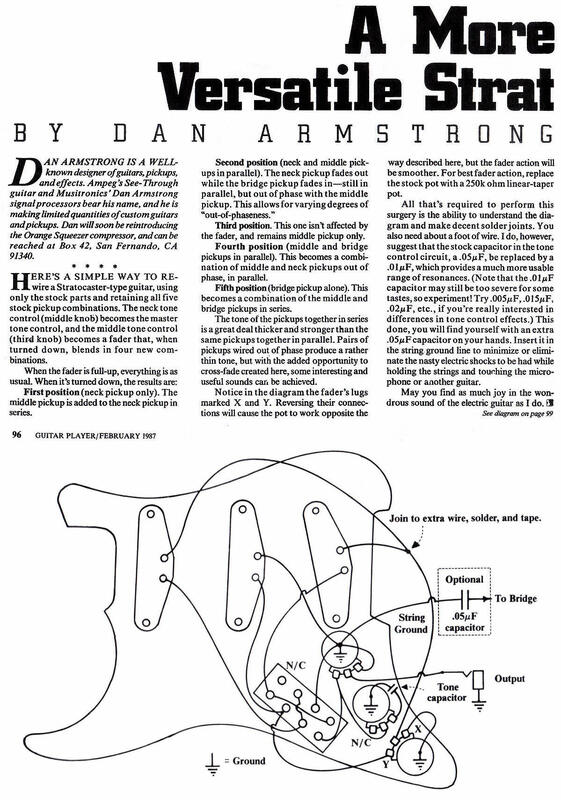 Not that you have to of course, only suggesting out of interest really - for my own taste, I've always wanted to have a tone control that works on the bridge pickup for one thing. I've got the first scheme on two of my own strats, and can confirm it works very nicely indeed. Haven't tried the second, but it looks interesting. Both give the standard strat 5-way operation when the blend is not turned up, with master volume and tone, and both circuits use the existing components and no extra switches. I rather fancy the first option. 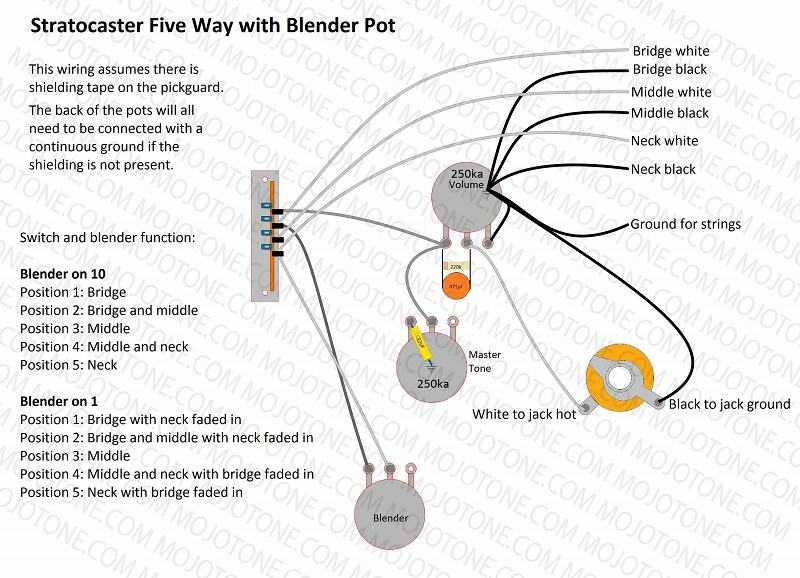 What value have you used for the Blender pot and have you used a Linear or an Audio taper? My Sienna Burst Strat has tone control on the Bridge pick up. 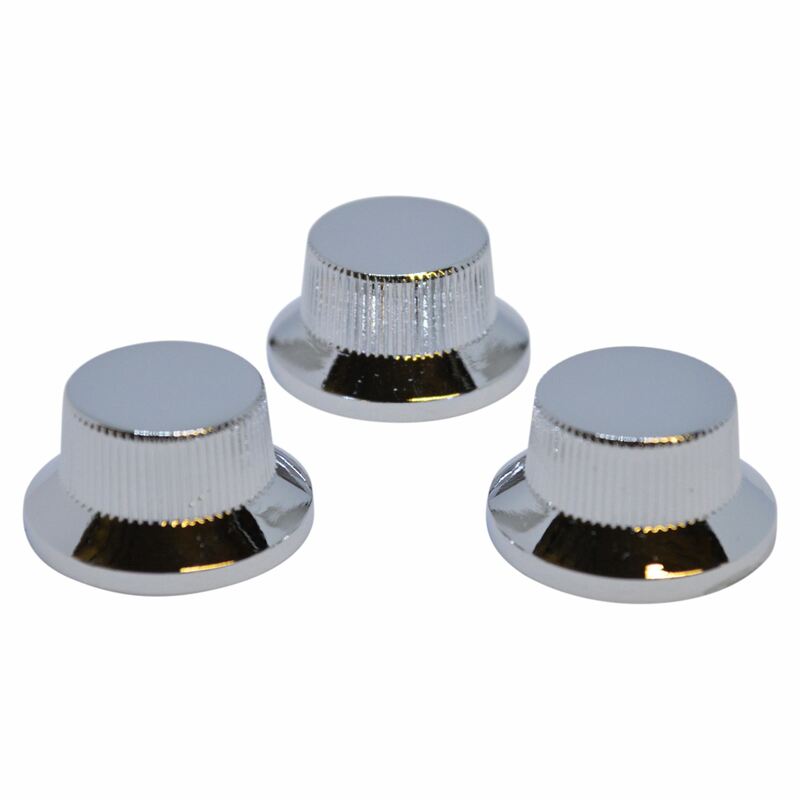 There is an indent on the tone control, which takes it completely out of circuit, to revert back to standard Strat configuration. 250 ohm audio taper works nicely for the blend - in theory the 250 ohm "no load" type sometimes used for tone controls are better still, as that puts an infinite resistance in the blend loop to take it completely out of circuit when not used. But I've tried both standard and no-load 250 ohm audio pots for the blend, and in practice, to my ears at least, results are indistinguishable. Nice design on your sienna burst - I do like that guitar! Confirm please. 250Ω or 250KΩ? Hope it goes well and the results are to your liking. Decided to stick with the standard configuration. I fancy the blend pot, but since it is a gift for someone else I think I had better go the norm. Had to strip the pups on my Gordon-Smith today, after one of the adjusting screws dropped out. Luckily I didn't lose it, as it is a slot head brass screw, and probably unique to the marque. Once I set it back up it is a lot louder than it was, with very little adjustment to the pup height. "Getting the tools out again" Fnarr fnarr. I am still waiting on the pups. It is not started yet so I haven't made a final decision on what circuit to go with. This afternoon I replaced the nut on the Aria. I slackened off the strings, took a blade round the edge of the nut (in case there was any lacquer on it), a quick tap along the length of the fretboard and the nut was off (bound neck). I then placed the Axetec Graphite nut on the neck, tuned up the strings, and it looked great. It also felt great. I then put my clock gauge on the first fret and it was spot on. I couldn't have filed a nut any better (lucky white heather). Played guitar, with some heavy bends, and the nut never moved (so I am not going to spot it with PVA adhesive). The job took all of 15 minutes. De-tuning and re-tuning took the most amount of time. If the nut slips over time I will add a spot of glue, but as I will not be gigging it I won't bother until it does or until I next change the strings. I hope the job on the Strat is such plain sailing! Megi’s wiring does look interesting. I quite fancied doing that myself. BUT I went with something simpler. It’s in my post “Number 6 On Its Way”. Basically, it involved having a four way switch and a blender for the middle pickup. I dont use the middle pickup on its own. The switch gives you neck, both in series, both in parallel, and bridge. It is all kinds of awesome! Love it love it love it! I read that, but I have all the bits, including a 5 way switch. Did you go for the cream/ivory coloured nut on the Aria Jocko? or the black one? 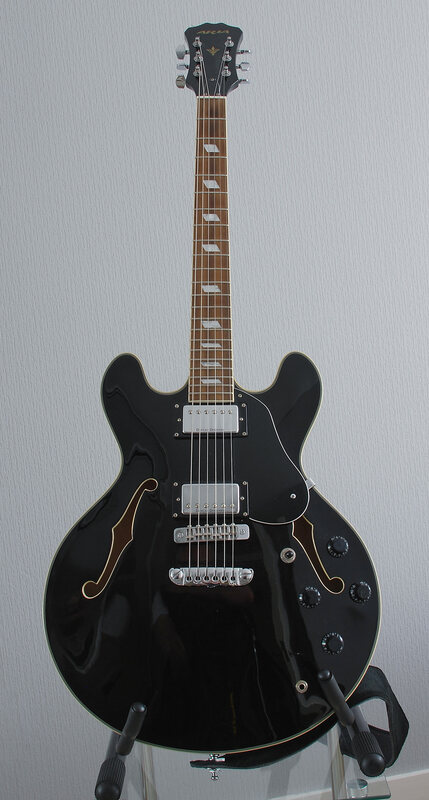 Not that it matters, but one of my guitar heros, Larry Carlton, has a black graphite nut on his 335s, and it's also on the Larry Carlton Gibson models, and to me it looks kind of cool. And all the best with the wiring, whichever one you choose. May the best wiring win. Did you go for the cream/ivory coloured nut on the Aria Jocko? or the black one? As I said in my original post, I went for the Ivory. I looks great. I'm sure it does, remiss of me - of course you did say in the original post. Just got another project to do. Corey was given an Elevation ST his grandad found in a skip. 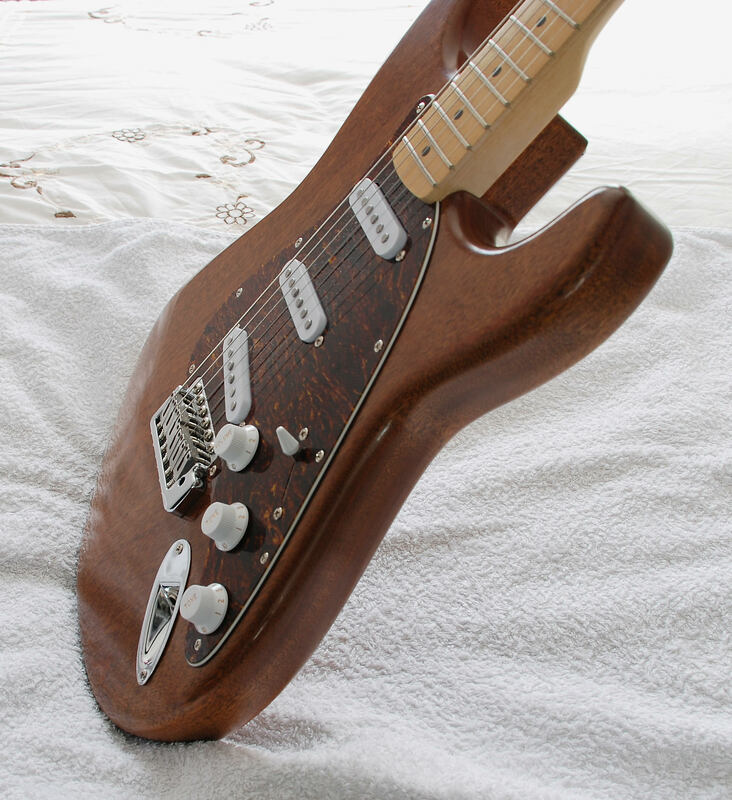 You can buy them from Argos, currently at £69.99, but this is the older style with the maple fingerboard. And going by the dirt on the higher frets it has been well played. It is a great playing guitar with a reasonable sound. Unfortunately he came to replace a broken string and found the "Monkey dung" block has split through the 2nd string fixing. I have some old Squier bridges kicking about so I will do a replacement. I'll do a full set up at the same time, but as I said, it already plays nice, so I may not have much to do. Before removing the strings I checked the neck relief. I tightened it slightly. I like very little relief and anyone who gets a guitar I have set up gets that by default! Nut was loose so I spotted it in with a drop of PVA adhesive. Built and fitted a new bridge, from bits in my spares box. I also fitted a pair of Graf Tech string trees I had lying in a packet (I had used the nut on a guitar fitted with my trademark roller string trees). I cleaned the fretboard and oiled it with F1 (it is an unfinished Maple neck). Once the neck is conditioned to my satisfaction I will restring with Fender Super Bullets (9's). ... found in a skip. I find it hard to believe that someone would throw a guitar into a skip. Great work on making it playable, Jocko. Great work on making it playable. They have had the guitar for a couple of years. First Brian then he passed it on to Corey when his "Vee" was in dock. It has been a very playable guitar until the block fractured. If I can get it back to how it was I'll be pleased, if I can make it better I'll be ecstatic! Fitted the Super Bullets and set it up. I had to add a bit of relief back into the neck as the guitar appears to have been set up professionally at some time in its past. The nut is beautifully cut with minimum headroom at the first fret. My straightish neck caused the 6th string to buzz over it. I had to set the string heights and intonation for the cobbled together bridge, then I was able to try it out. It has amazingly powerful pick ups, so it looks as though they have been changed at some time. With the maple fingerboard it was remarkably like playing my American Standard. Hard to imagine over £1,000 difference in price! Hard to imagine over £1,000 difference in price! I recently watched an interview with Paul Reed Smith. He said that there is little difference between a $2,000 guitar and a $200 guitar as they both have all the same principle parts; except that the $2,000 guitar will have had much more attention paid to the quality of the parts and the finer details of how it is made. Pulled out my Stratru-caster today. 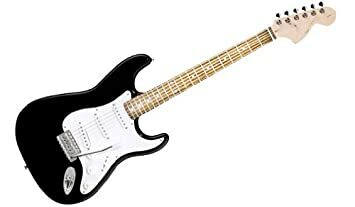 Thought I'd play it for a week or so before modding it and putting it away for my grandson, but it sounds so p*sh after the cheap Strat clone I stuck it back in the case. I'll start building the new electrics in the next couple of days. I have decided to go for the blender circuit. Meanwhile I am giving my Epi Les Paul an airing. Nice work on the Elevation ST Jocko - can't have people throwing guitars into skips, when what they need is just a bit of tlc from someone with your skills. And yay! re your doing the blend circuit - it does still allow the standard 5-way settings, so fairly uncontroversial, and I'm sure the recipient will like it. That Epiphone LP Custom is a handsome beast! can't have people throwing guitars into skips, when what they need is just a bit of tlc from someone with your skills. As I said to Lester, there was nothing wrong with it when it was thrown into the skip. It is only the last couple of weeks that the trem block sheared! Did the mechanical assembly of the new electrics onto a spare Strat pick guard. I will build it, wire it and test it, then swap it all over onto the proper, bespoke pick guard. That way I avoid doing any damage to that guard or the guitar body. I'll maybe start the soldering tomorrow. Wired up and tested the pickguard this evening, complete with Blender pot. If I was building another I would probably go for a 500KΩ Blender pot (or the no load type mentioned), as the 250KΩ doesn't quite stop all the "blend". All I have to do is strip the guitar and transfer the wired hardware to the bespoke pickguard to try it out with some music.